Adam Lambert Releases New Label Deal – FINALLY!! You are here: Home / More Featured Posts / Adam Lambert Releases New Label Deal – FINALLY!! Hallelujah! Adam Lambert’s new label deal is out and it couldn’t be better news! Although we heard months ago during an interview with Ryan Seacrest that Adam was signed to a new label, he wouldn’t reveal who it was with. Speculation came to a head a few weeks ago when blogs were reporting that Adam was being followed on Twitter (twollowed?) by Warner Bros. Records. Adam finally confirmed this yesterday in an exclusive interview with Billboard. Adam revealed “the first single will be out in April. I think people are going to be really surprised. The album feels like a new era for me — emotionally, lyrically, sonically. It feels fresh, it feels new. It’s still me. It’s still stuff that fans know and love but it’s a new chapter 100 percent. I wanted something more internal and more grounded. A little less with the theatrical and the camp and the presentation. I wanted to bring it in a bit more. Being on the road with a British rock band, and being in London a lot this year, rehearsing with them and doing TV gigs, I think that has affected my sound and where we are headed with it. I learned a lot about my fans through the years — the big picture of it and how you have to listen to them. Is your heart beating faster now?! First single in April! Read the following Billboard exclusive and let us know your thoughts in the comment section. It’s said that you can’t keep a good man down, but in the case of Adam Lambert, he was down barely 24 hours. 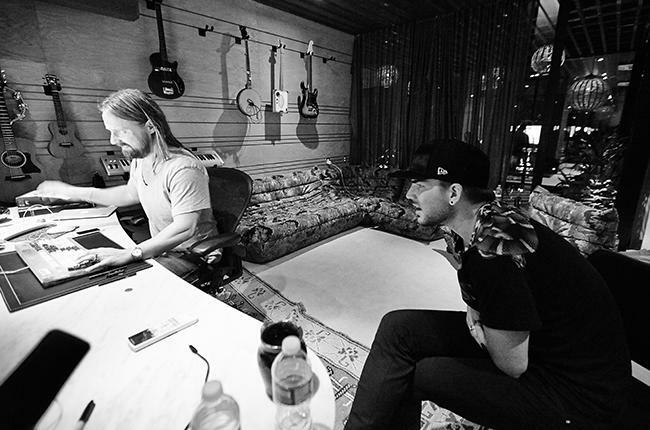 Ever the go-getter, Lambert and his management team at Direct Management Group regrouped and brainstormed, deciding to reach out to Swedish songwriter-producers Max Martin and Shellback. The two first worked with Lambert months after his Idol near-win and the collaboration yielded two hits, “Whataya Want From Me,” which reached No. 10 on the Billboard Hot 100, and “If I Had You,” which spent 20 weeks on the chart, peaking at No. 30. Four years after their first sit-down, the trio picked up where they left off, with Martin and Shellback offering to executive-produce the 32-year-old singer’s next release, his first under his new multiple-album deal with Warner Bros., due out in early summer. Oh joy! Oh bliss! Oh rapture! What an exciting announcement. This has indeed been an amazing week from the start of the QAL European tour to Adam’s judging stint on AI to this most recent piece of news. I’m going to be on tenterhooks until the release of the single in April. QAL are currently sitting in the top spot but are fast losing ground to Foreigner / Styx / Don Felder. QAL definitely deserve the top spot, so fans need to VOTE VOTE VOTE once an hour to keep them at #1. The poll closes on February 3. Ooo, that was an easy vote! Go out and vote everyone! Thrilled to hear this news! Maybe Adam will turn to his soulful rock roots this time. Can’t wait to hear the results this spring. It’s a new dawn, it’s a new day! Which of course we knew 6 years ago. Are you just figuring this is what must have happened or do you have an article about it? If so, please share a link here, thanks! Totally my interpretation of what I’ve read. If I come across the article that lead me to believe this I’ll post it. Here you go. Straight from Warner CEO http://www.billboard.com/articles/6443482/warner-bros-ceo-cameron-strang-signing-adam-lambert?utm_source=twitter I only embellished a tiny bit. Yay! I can’t believe they waited so long for that, but glad none-the-less. I just voted & so far Queen & Adam are in the lead at 47%. Please everyone make a note to vote as often as you can! Yes…we did know about this amazing Rock God six years ago! The very first time he walked on AI to audition. It’s been a full circle with him judging on AI this last week…2 hours of shear BLISS for all the Glamberts He did such an amazing job as well as per JLO & Harry! His raise has taken longer then I would have ever thought for Adam to get where he is now…but the momentum has started & thinking the gig with Queen (which was FRIGGIN FANTASTIC) should certainly assist with radio air time when his single comes out in April. OK DJ’s across the world…no denying this super start talent any longer! Give him a spin…you won’t believe your ears & you won’t believe how you didn’t give him the opportunity sooner! I know he will eventually be up there with the world’s best of the best! So Exciting…he’s like my Crack….I just can’t get enough!!! Finally! Every time I am just about to give up hope, a rainbow appears! I loved the QAL concert at Madison Square Garden, but I thought, Adam needs to be here on his own! Loved him as fill in judge for Keith on AI this week! Can’t wait for his single in April! Only hope its release is not delayed. Wish Queen would allow him to include “Love Kills” on his new album. His version in concert was spine chilling! I am so happy for Adam. He is such a great singer and entertainer ! I know he is going to do real good!! I love you Adam! I’m one of the ones who are totally, completely maaaaaaaaaaaaaaaaaaad about ‘Adam. Anything he is does sounds good (or better) than the rest. I love hearing him sing ‘reggae.’ Oh who am I kidding? I just love entirely everything do does! Oh wasn’t he gorgeous in that blue suit in Idol this week? Hum!!! !